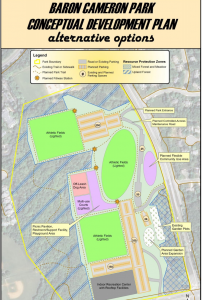 As the Fairfax County Park Authority continued its Baron Cameron Park Master Plan process with a public hearing on Thursday, the main takeaway was that public opinion has not changed very much from a year ago. In early 2013, Reston Community Center began examining building an indoor recreation center and pool in the park and the FCPA started to plan for the 68-acre parcel’s future in general. The park is home to 10 athletic fields, a playground, 32 community garden plots and Reston’s only off-leash dog area. Proposed changes include upgrading the athletic fields to full-size with synthetic turf and lights; increasing parking; adding a second park entrance; building a restroom and picnic pavilion; adding community garden plots and a fitness trail. An alternative plan includes replacing athletic fields with the indoor recreation center and additional parking and relocating the existing dog park to a central location within the park. In 2013, there were a series of sometimes-emotional meetings about RCC’s plans to build the pool, which consultants say would cost about $30 million. Swimmers made the case that the community definitely needs this amenity as RCC’s current pool is more than 35 years old and very outdated. But many community members said they were against the cost of a county facility being the responsibility of Reston residents in Small Tax District 5. Thursday’s meeting was not much different. The swimmers still want to swim. Opponents are still opposed. The re-imagining of Baron Cameron comes, in part, as the Reston is preparing for an influx of population after Metro’s Silver Line opens here later this year. The Reston Master Plan Amendment estimates the area will see and additional 22,000 residential units, and those tens of thousands of residents will need places to play. Several speakers suggested the indoor pool be built in the North Town Center area, closer to housing and the future Reston Parkway Metro. That site is the only alternative still under consideration, RCC says. The Dog Park — many dog owners said they do not want the off-leash area moved. With increased population, there is sure to be an influx in dogs, so some advocates say the dog park should be expanded. 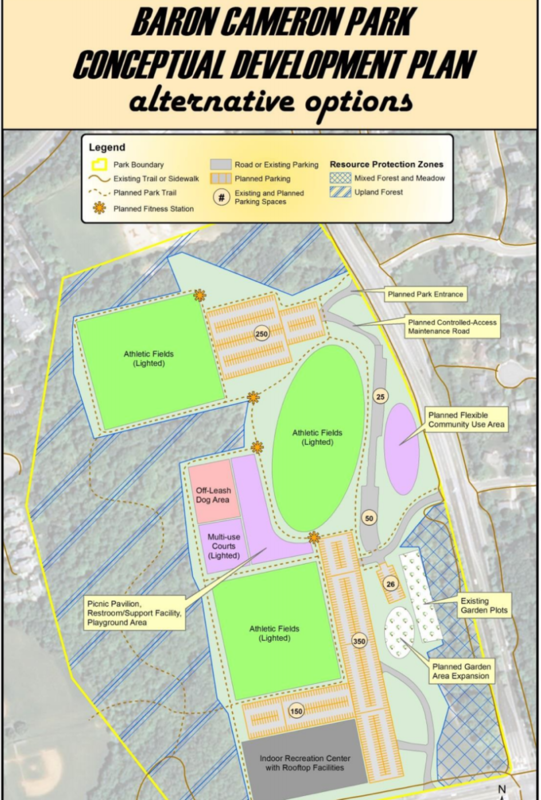 Tammi Petrine, co-chair of Reston 2020, suggested the dog park be moved to the more expansive Lake Fairfax Park. Not speaking up on Thursday was the group of Longwood Grove residents who have filed an injunction against Reston Dogs Inc., the sponsor of the dog area, and the FCPA, to shut down the dog run due to excessive noise. Reston’s Memorial Garden of Reflection — Reston lacks both a cemetery and a quiet spot for reflection and remembrance, said members of Initiative for Public Art Reston (IPAR). They would like to see a memorial garden included in the plans for Baron Cameron Park. The idea has also been included in the recently approved Reston comprehensive plan amendment. “Reston has no area for a special place for people to be remembered, where we can go and honor and celebrate Restonians who have passed,” said IPAR president Joe Ritchey. FCPA will be accepting public comments on Baron Cameron Park for 30 days. There will be revisions to the master plan in the spring, and the park authority board hopes to take action on the plan by summer. Send comments to [email protected]. RCC will continue its own process about the indoor recreation center. That plan would eventually go to a referendum vote in Small Tax District 5, but executive director Leila Gordon says she does not think that will happen in 2014. The Reston Citizens Association will hold its own Town Hall on Baron Cameron on April 7 at 7 p.m. at Buzz Aldrin Elementary School. See all documents relating to the Baron Cameron Master Plan on Fairfax County’s website.